Akron, Ohio has a speeding problem. High speed traffic endangers lives and prevents the revitalization of neighborhood business districts. 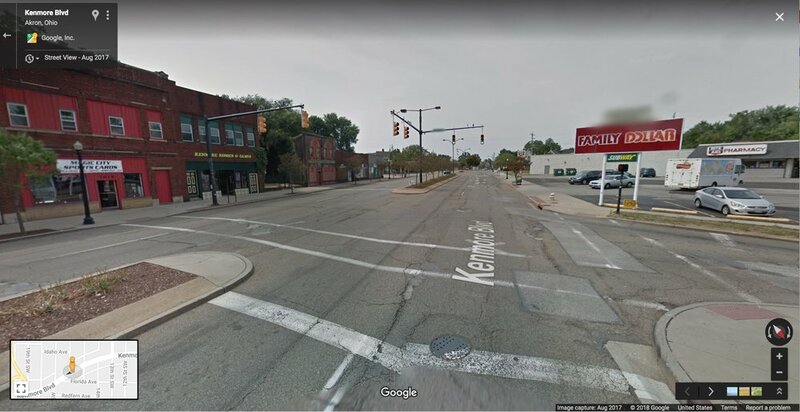 But Akron also has advantages in combatting this problem: streets with plenty of unneeded capacity to spare, and a city administration that understands when it's time to "right-size" things. Most recently, the city has applied this "right-sizing" treatment to Kenmore Boulevard, home to the city's largest neighborhood business district outside of downtown Akron. We'll take a look at the boulevard's new face in a bit, but first, let's zoom out and understand the problem Akron faces. A September 13th article from Akron.com describes the concern about speeding in Fairlawn Heights, where drivers use the neighborhood as a cut-through and may go anywhere from 35 to 50 miles per hour in 25 mile per hour zones. According to Geiger, people are moving out of what they thought to be their forever homes because of speeders and worries about their children. “Most of them say it’s an accident waiting to happen,” Geiger said. According to that article, and this one from the Beacon Journal, Akronites in multiple neighborhoods, not just Fairlawn Heights, have asked the police to step up speed enforcement. But there's reason to doubt that, on the whole, Akron's speeding problem is an enforcement problem. How do I know this? Because speeding is almost never an enforcement problem. Evidence has accumulated over the years that when the posted speed is significantly lower than the design speed of the street (that is, the speed at which the physical conditions—lane width, sight lines, the presence or absence of visual or physical obstructions, etc.—make it feel comfortable to drive), design speed wins. Put simply, most drivers speed, and nearly all drivers speed when the street itself is telling them to. For speed limits to be effective... they must appear reasonable to most drivers and correctly reflect the maximum safe speed for prevailing conditions. Since the underlying criteria and assumptions in the design speed concept are based on long-standing comfort and worst-case conditions, such as braking on wet pavement, the comfort of a blindfolded passenger in a 1930s vehicle, and the reaction times of impaired drivers, it should not be surprising to find that the speeds of many motorists driving under normal conditions safely exceed the minimum design speed. Wide, unobstructed, drag-strip streets tell drivers to speed, and most do. In Akron, we can add to this basic fact of psychology another problem. Akron has a street network designed for traffic volumes much greater than exist today. And this means dangerously high-speed traffic. The initiative stems from basic demographic reality: Akron—like many cities across the upper Midwest—has lost about one-third of its population since its industrial heyday in the 1960s. And also like many cities that have lost a lot of population—Detroit, Cleveland, Buffalo—wide, empty streets linger unneeded. Population loss causes a well-known set of problems — abandoned houses, vacant lots — but it is also causes a transportation problem. Wide, traffic-free roads encourage speeding—which can also be an equity issue if the urban poor live mostly in the depopulated areas, as they do in Akron. 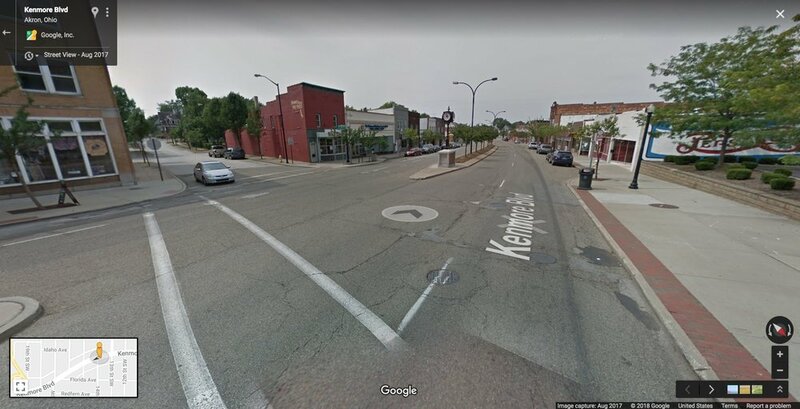 Akron Planning Director Jason Segedy identified roughly two dozen four-lane streets in the city that carry less than 10,000 cars a day, meaning a two-lane road would easily suffice. Segedy himself describes this process as "right-sizing" Akron's wide streets. We at Strong Towns would describe it similarly, but with one additional, crucial insight: it's not just about the size of the street, it's about the failure to be clear and honest with ourselves about a street's purpose. A hugely disproportionate share of traffic fatalities occur not on neighborhood streets, and not on fully grade-separated freeways, but on stroads. The stroad: a dangerous design that results in a place where traffic flow is inefficient, but people also don’t want to be and aren’t safe on foot. The stroad is a street/road hybrid. It's the futon of transportation infrastructure: a bad street, and a bad road—much like how a futon is an uncomfortable couch that turns into an uncomfortable bed. A stroad is typically a major urban arterial or boulevard with at least four lanes of traffic, many access points (driveway curb cuts and cross streets) where collisions may occur, wide lanes, and a speed limit between about 35 and 50 miles per hour—speeds at which you are likely to be killed if struck by a car. The purpose of a good neighborhood street is to be a platform for creating wealth. Nowhere is this clearer than on Akron's Kenmore Boulevard, where local entrepreneurs have brought some much-needed life and vitality to the neighborhood's heart in recent years. To be such a platform means a good street must be a place that tolerates the chaos of people walking and milling about, and a good street must be a place where people want to linger. The purpose of a good road is to be an efficient connection between places. It serves this purpose well, and safely, if it is designed solely for that: limited access, and a simple, predictable environment that facilitates traveling at speed. The stroad fails at both. Because it accommodates traffic at dangerous speeds, it is an uninviting and dangerous place to linger. And because it is a chaotic environment with many potential points of conflict, it doesn't move traffic efficiently. Akron needs to decide what its major thoroughfares ought to be: streets, or roads. Trying to be both is a recipe for failure at both. The city's "right-sizing" program is based on the belief that places like Kenmore will better thrive in the future if their neighborhood main streets are treated as platforms for creating wealth and inviting human activity. Traffic can flow, but it must flow safely and slowly as well as smoothly. According to the NACTO (National Association of City Transportation Officials) Urban Street Design guide, having 4 lanes on a neighborhood main street increases pedestrian crash risk, as well as rear-end and sideswipe impacts. Thoroughfares which see up to 25,000 vehicles per day (many of which are stroads) may be appropriate candidates for a road diet to transform into roads: reducing 4 lanes to 2, with center turn lanes where needed to facilitate left turns. Created by Daniel Herriges via Streetmix. Change requires an adjustment period, and not everyone is going to be comfortable with this change right away. And there may be problem spots that are ripe for incremental tweaks—a recent Akron Beacon Journal letter-writer describes the interchange where Manchester Road meets Kenmore Boulevard as one such area. Parking is another aspect that might be tweaked in the future to accommodate local needs. While there is ample parking in the area as a whole, two residents I spoke with mentioned to me that the road adjustments did end up removing more spaces on Kenmore Boulevard itself than they had expected, on account of "daylighting" at intersections (preserving sight lines so drivers can see cross traffic and pedestrians). But on the whole, the evidence for the benefits of road diets like this is crystal clear. The two main ways Kenmore stands to gain are increased safety, and increased economic vitality. Safety: ProPublica summarizes research on the likelihood that a person struck by a car will be killed based on the speed the car is traveling. This likelihood begins to increase dramatically above 20 miles per hour, and becomes very significant above 30 mph. And that risk is especially high for older people. Economic Vitality: Local business owners sometimes fear, when a road diet is proposed for their street, that it will harm business by deterring customers from coming to the area for fear of not finding parking when they arrive. The evidence doesn't support such predictions. In fact, a walkable main street is an economic boon to a neighborhood: it becomes a destination, in which businesses can all benefit from proximity to each other, and can be serendipitously discovered by those walking by. This "Mythbusters" fact sheet from the Federal Highway Administration offers evidence that road diets have positive, not negative, effects on local business. In Charlotte, NC, the local planning manager led a before-and-after study, which found a 47 percent increase in property values along the city's East Boulevard after a road diet was implemented, even despite the Great Recession. The Economic Merits of Road Diets includes links to a few more studies on the value to local businesses of calming traffic. 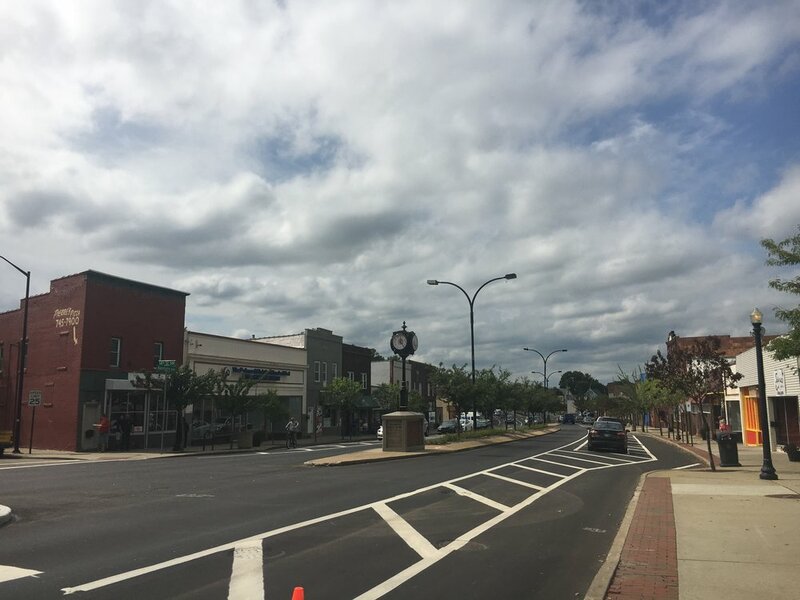 After narrowing a former state highway to two traffic lanes with widened sidewalks, downtown Hendersonville, N.C., became more pedestrian-friendly, especially for the one out of four town residents who are retired. 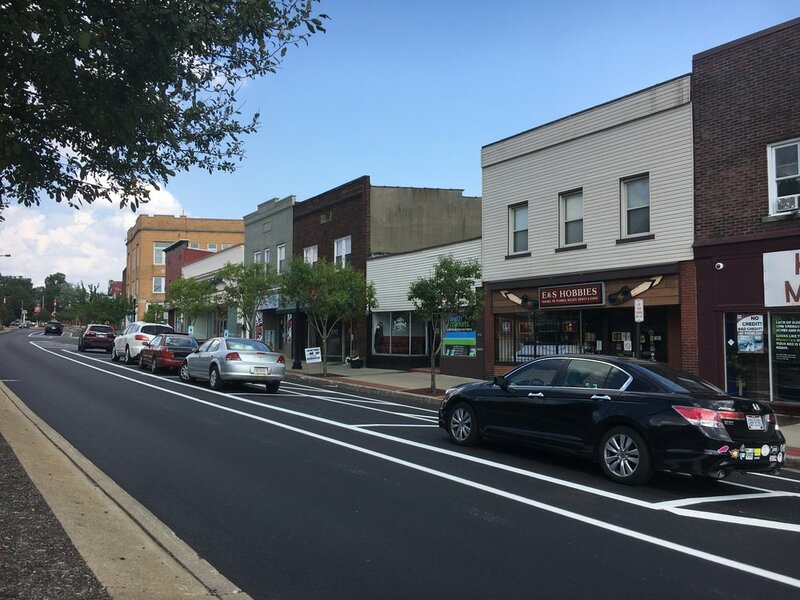 When the highway was rerouted to adjacent streets and the Main Street improvements were completed, Hendersonville’s retail vacancies dropped from 14 to one. Kenmore is a neighborhood that has seen difficult times, but it has a huge advantage in its neighborhood "downtown," which draws shoppers from all over Akron and the surrounding region. Residents have a long history of having things “taken from them,” says the Kenmore Neighborhood Alliance’s Tina Boyes. 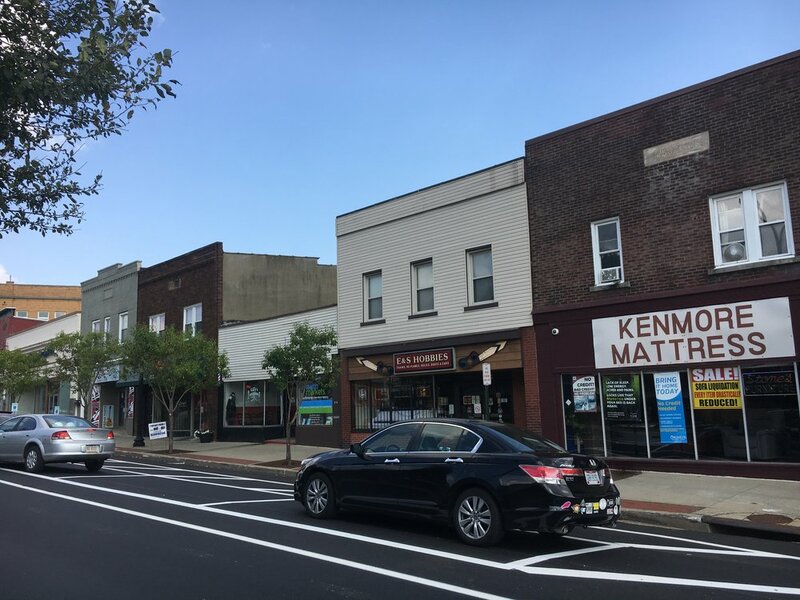 This time, the City of Akron has given Kenmore a gift: a right-sized street that is better suited to become a place to linger, shop, and socialize. That is to say, a place that produces real wealth. When a neighborhood commercial street comes back to life, the whole city benefits. Pick a focus. Get to work. How can city governments and neighborhood groups work together effectively to make their town stronger?